The ergonomics of my workspace are very important to me. I make lots of tiny adjustments over the course of weeks to get everything working in harmony. This is all destroyed almost every time I take a day off from work. Someone will need to leave a note for me and somehow this involves moving my keyboard, moving the mouse, lowering my chair, tilting the monitor and stealing a pen. Maybe next time I should draw chalk outlines where everything is supposed to go. Also, if you are hanging out in the Detroit suburbs this weekend, come see me at Penguicon! oh n i totally understand about having your workspace adjusted for you. i almost have a degree in computer science, n that kind of obsession kinda comes with the degree. I see Biff has the new Nintensoft Xcube 360. I do the exact same thing with where I live. It would be a lot more effective, though, if my roommate wasn’t a total slob. I love the Final Fantasies. My brother overwrote my data in FF VIII around disk 3. Mother dearest threw away unusual plastic device when I progressed far into the game. Friends spilled soda onto plastic with memory card in it when I was in the castle at the end of the game. Similar stories exist for FF IX. unless that stranger is Biff! I’m wondering how Biff plans to be able to play his game again later… Must be ‘challenging roommate’ behavior week. Well, It’s been a while. This remindes me of the time my brothers friend brought over his memory card, and left it here for a long while. I can’t rember if we lost it,and bought him a new one, or returned it after a few months. Now, I have a wii and a ps3, the wii needs a memory card soon, but the ps3 still has a lot of memory on it, about 80gb when I got it. I used to leave zelda 1 on all day while I was at school and I had to put up a cardboard blocker so no one (read:mom) could hit the reset button on my nes. 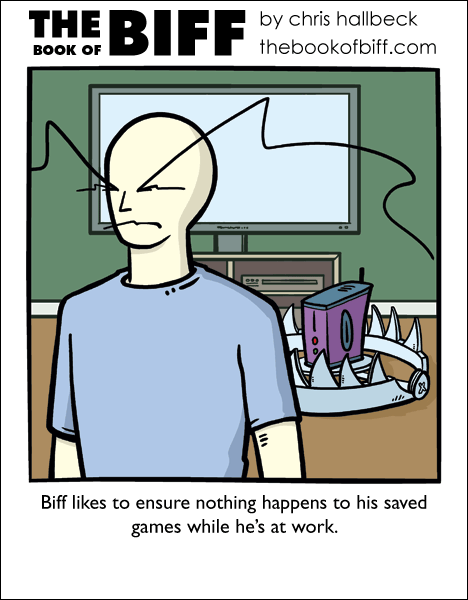 The worst part is that the “roommate” (or who ever Biff is with) could find one of Biff’s gadgets to disable the trap. Or they’d brave the trap to play Biff’s games; but not having arms kind of defeats the purpose of playing video games, right? I make video games, if someone was to delete GCV/GCA (my biggest one which i shale only call by its acronym for no obvious reason (technically its two separate games but there tied together so much often call them one)) I would lose about 4 years of working on it. Yes on and off, but it still has several hundred hours of work in it. Of coarse i have probably 100 backups hidden in various locations. Also if i ever finish it (GCV is almost done, mostly waiting on artwork and GCA) I will post a link to it here and that link will be in my website link! Next frame: Biff from Earth C suspended from ceiling, grabbing computer. Just curious, what program are you using to create your game? I use Multimedia Fusion Developer 2 to make my games. I needed this my freshman year of college. I left for a weekend and one of my roommates decided that my ps2 along with games was his personal property–and there went a 100+ hour saved game of FFX. Turing. Its a programing language i leaned back in grade 10 that is meant only to learn how to program but is a surprisingly good language, although I cannot find a link to download it. So yes i actually program. The game i am talking about sums up to about 14000 lines of code. After more looking for a link for Turing I found one: http://compsci.ca/holtsoft/. this reminds me of the countless amout of times i left a console one over night back in the old days cause they didn’t have places to save. I don’t have a roommate, so I’ve never run into problems with saved games being erased. My parents have no interest in video games. The worst thing is when the power goes out when you’re saving and ALL your save games get eradicated. Katamari Damacy, I shall miss you. Pah, who cares for the console? What about that plasma TV? Can’t play without a screen. I hate how whenever I get up from the computer to do something quick but necessary, my roommate always sit down and takes it over while I’m afk. The worst part is when she closes my browsers or shuts it down after she’s done and I still had stuff going on. I’m going to have to start doing that myself.